Almost 35 percent of all pediatric visits are for ear problems--about 10 million cases per year involving ear infections (otitis media). 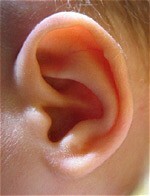 Otitis media is caused either by a bacteria, or a virus, and often follows a cold, or is caused by the cold. Many children have ear infections year after year, and are at grave risk of suffering permanent hearing loss, as well as other developmental problems. Antibiotics is the standard treatment in most cases, but if the cause of the ear problem is a virus, and not a biotic agent (a bacteria), antibiotics, of course, are of zero help. Even in the case where the cause is a bacteria, the body's own immune system is usually more effective in fighting the problem than are antibiotics, which pose great dangers in themselves. Repeated doses of antibiotics can, in an ironic Darwinian manner, create a breed of bacteria which are super-strong and resistant to the antibiotic. In children under two years of age, chronic ear infections are the second most common reason for surgery. Unfortunately, the procedure has to be repeated in about one-fourth of the cases. Before you subject your child to an operation, and perhaps a second one, or an extensive course of antibiotics, you may wish to consider letting the doctor look at your child. It may be that after a series of adjustments to his or her spine, that your child will at last be freed from his or her constant ear aches. A chiropractor in Yonkers, New York, Dr. Joan Fallon, published research showing that almost 80 percent of the children treated with chiropractic adjustments were free of ear infections during the six month period following the initial treatment. Essentially, chiropractic treatment promotes drainage of the ear, which facilitates a growth in the body's own antibodies, and the child recovers more quickly than with traditional treatments. Please call the number above to make an appointment for your child to receive a free consultation.